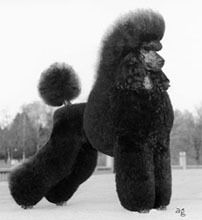 Standard Poodles Dog of The Year in Sweden! 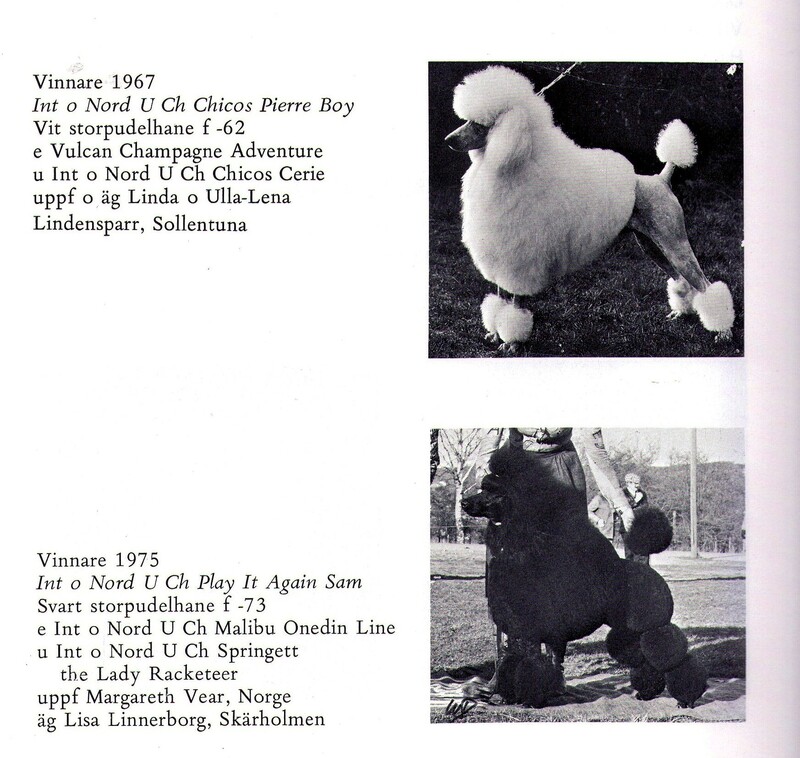 We are very proud that “our” Rocky is a part of the history among the Standard Poodles in Sweden. He is the 4th Standard Poodle in the history to get the title “Guldhund” or Dog of The Year as its called now. Ch. Leander Midnight Cowboy never got the title because of the rules that was by the time,, anyhow he was the Top Winning Dog Allbreeds 1971 in both Sweden and Norway. 1967 Ch. Chicos Pierre Boy was the first one out. 1971, Ch. Leander Midnight Cowboy and 1975 Ch. Racketeer Play it Again Sam, bred by Margareth Vear and ha1991 the historic Lady “Racketeer” Margareth Vear took me under her wings and she let me be a part of her Standard Poodle, Ch. Racketeer Exquisit Sinner “Hsan”. This turned out to be a successful team and god it was FUN!! She told me the stories about the Standard Poodles in the Scandinavian and English history. I will write more about that later, but I think any of the new ones that starts with the Standard Poodles or of any size; Read the history, read as many books you can or magazines. Try to talk and ask the “older” breeders they have so much to give and you have so much to learn!! It will give you a picture and hopefully a bit help to understand the breed more. 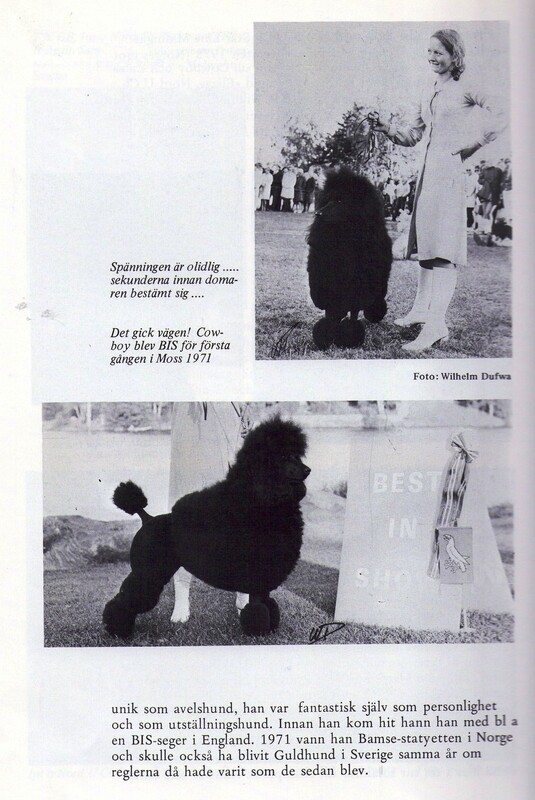 The picture I have here is from the Swedish Poodle Clubs “Jubileumsboken” 1942-1982. Very interesting reading for me that missed the dogs from this time as I started 1985. This is Margareth with her “Cowboy” I think I dare to say he was The DOG of her lifetime. He still has a big place in her heart. Cowboy was a very important part of the Scandinavian Standard Poodles. ← William turned 1 year old!